Do You as a Healthcare Professional Look Forward to or Dread Family Holidays? When you contemplate getting together with family, do you smile to yourself or think “oh no”! Even as healthcare professionals, who generally are more understanding and compassionate with our patients, we don’t pick our family members, so sometimes the rosy picture of family get togethers does not fit with all families. In addition, nurses like myself who did not have children, and worked on nursing units, had to struggle with whether to cover for those peers who did have children, especially for the Christmas holiday, or be with our own families, as I often felt guilty if I wanted to take a Christmas off. First, take some time for self-reflection. Identify what part or aspect of the get together is most stressful and if you can take a holiday off without feeling guilty if a mother, etc. has to work. Ask for other people to help by at least bringing a side dish. Allow yourself to scale back your guest list to those people you really want there and that you can comfortably accommodate in your home. To reduce stress on everybody, consider meeting at a restaurant so no one has to expend too much energy decorating, cooking and cleaning up. 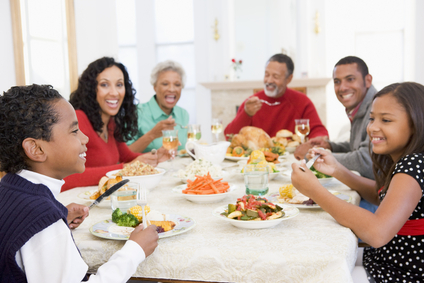 Should you be invited to another family member’s house and you know a family member who shall we say is not your favorite person will be present, preplan a seating arrangement with the hostess where you are as far away from the other person as possible to limit potential negative interactions. Some people live far away from their families, or as a nurse might give up their holiday for a peer, so it can be depressing thinking about the holiday dinners they will miss. One secret I learned years ago though is that as adults we can extend “family” to friends so getting together with them can be a good option to reduce feelings of loneliness and increase holiday joy. I also remember to phone my family to wish them happy holidays which a nurse could do before or after her shift, as a way to stay connected and get to talk to several family members on Christmas, as I travel back to my home state only for Thanksgiving. Holiday get togethers can be more fun and you can experience less holiday stress if you are open to slight modifications or adaptations. You may be surprised how receptive your family could be to the suggestion of a new tradition, and some family members might actually enjoy taking a more active part in the preparation or even having no responsibility just fun if you choose a restaurant option. Again, remember if you can’t be with your natural family members, a group of friends can often have just as much fun being with or going out with each other. Remember, phoning family if you can’t be present can also reduce feelings of loneliness and increase feelings of staying connected with those we love. If you would like to have more fun and be less stressed on the holidays, take a risk and create a new tradition!